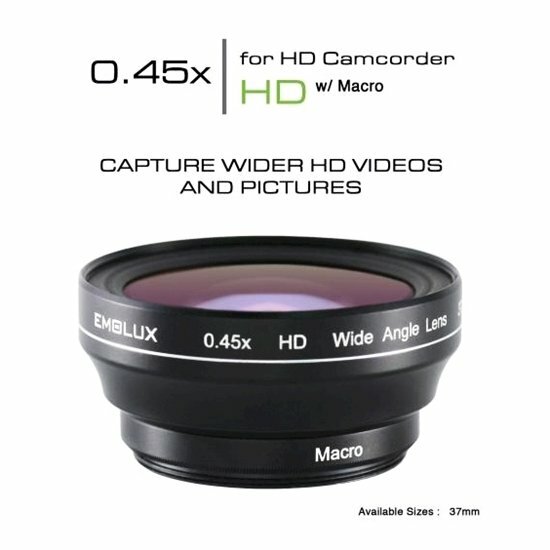 Emolux 0.45x HD wide angle converter lens (37mm) is designed exclusivity to be used on HD camcorders to capture both clear videotaping and sharp images. The optical lens system, made up of 2 precise polished optical glass are design to achieve ultra clear videography and pictures with 50% more field of view when mounted onto HD camcorders. Achievement of a wider angle does not seek compromise in side resolution and when mounted onto compatible camcorders or digital cameras, it produces sharp and well defined pictures from side to side. Essential features including high light transmission, anti reflection multi coating, darken glass edges and pro matt black housing further assure that when used in either videotaping or taking digital images, the same level of sharpness and brightness is attained in all situation. The availability of front filter thread in 49mm diameter allows further possibility to attach filters for other Effects. Detachable macro attachment is also incorporated as part of the lens design for close-ups photography. Suitable for Canon, fujifilm, Nikon, Olympus,Panasonic,Sony, samsung lens with filter size of 37mm. To find out your lens' filter size, look out for marking (On your lens or lens cap) like ⌀37, which means the filter size is 37mm and you should get this wide angle converter lens (37mm).